Having received more than 200 awards and recommendations from international hardware websites and magazines, Noctua’s flagship model NH-D15 has become a benchmark for elite-class dual tower coolers. The SE-AM4 version is a dedicated special edition for AMD’s AM4 (Ryzen) platform featuring the latest SecuFirm2™ mounting system for AM4. Topped off with two of the renowned quiet NF-A15 PWM 140mm fans, Noctua’s proven NT-H1 thermal compound and a full 6-year manufacturer’s warranty, the NH-D15 SE-AM4 forms a complete premium-quality solution that represents a deluxe choice for both overclockers and silent enthusiasts who strive to tune their AM4 systems to the max. Please note that being a dedicated special edition for AM4, the NH-D15 SE-AM4 comes with AM4 mounting hardware only. Tens of thousands of enthusiast users all over the world swear by the NH-D15’s quality and performance. Recommended by more than 200 international hardware websites and magazines, it is renowned for being one of the best high-end coolers on the market. The NH-D15 SE-AM4 brings the NH-D15’s signature quiet cooling performance to AMD’s new AM4 platform. With its supreme capacity at extreme heat loads, it allows overclockers to push their AM4 systems to the limit and silent enthusiasts to run the fans at super-low speeds. 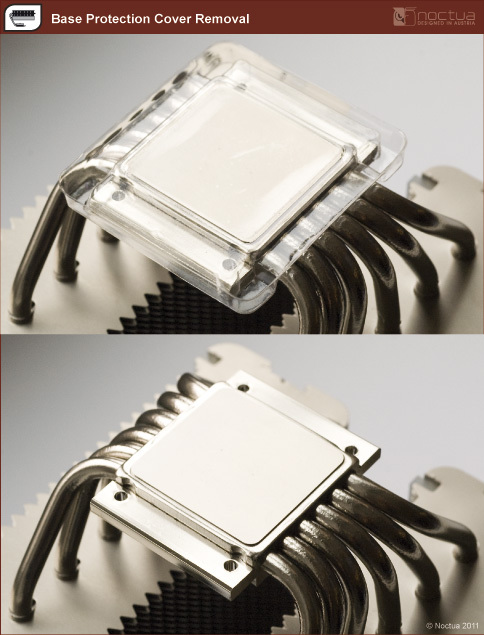 **The possibility of installing the cooler turned by 90° depends on the free space around the CPU socket and can thus vary from motherboard to motherboard. When someone asks me about getting a new CPU cooler if they are going the air route I always suggest Noctua as their coolers are proven and on top of that they are always easy to install. With the NH-D15 SE-AM4 you get both of those things. In our testing on the Ryzen 7 1700 the NH-D15 SE-AM4 was able to keep it at 26C during idle and 40C during load. That is very impressive! Even beating out Corsair’s H110i all-in-one liquid cooler. On top of that even with the low-noise adapters installed you get very good performance. Without the low-noise adapters installed the fans really are not that loud at all. Noctua has used their SecureFirm2 mounting system for years now and we love it. All of their coolers, even large ones like this are extremely easy to install, even for a beginner. It took us about 10 minutes to get this cooler fully installed and you can easily install this cooler with your motherboard inside of your case. NOCTUA a její SE AM4 edice, které vybrala, aby pokrývaly všechny eventuality a cenové relace, ukazují, co dokáží. U12S je stále velmi atraktivní model, jak výkonem a maximálně tichým provozem, tak samozřejmě naprosto bezkonkurenční kvalitou zpracování a stále rozumnou cenou. Obří D15 je pak prostě králem klasických chladičů, provedením a zpracováním naprosto bez konkurence, nicméně obří rozměry už občas komplikují život u některých sestav a také cenově už spadá do kategorie AiO chlazení, jež ale ne vždy jsou tišší. Το εξαιρετικά αποτελεσματικό θερμοαπαγωγό σώμα της, με την βοήθεια δύο ανεμιστήρων που με τις τεχνολογίες τους, αβίαστα αποσπούν το innovation award, είναι σε θέση να κρατήσει τον AMD Ryzen επεξεργαστή μας δροσερό και ασφαλή κάτω από όλες τις συνθήκες χρήσης και αυτό, χωρίς καμία ουσιαστική παραχώρηση στο θέμα του θορύβου, ο οποίος κυμαίνεται μεταξύ του εύκολα ανεκτού και του τελείως αθόρυβου! Ο χρήστης μετά από μια εύκολη και εξαιρετικά αξιόπιστη εγκατάσταση, μπορεί να έχει ένα επεξεργαστή ικανό να αντεπεξέλθει σε όλες τις απαιτήσεις του, καλύπτοντας το φάσμα από την σημαντικά υπερχρονισμένη, αλλά ήσυχη "παιχνιδομηχανή", μέχρι το dead silent multimedia σύστημα! Με δυνατότητες να κρατήσει το σύστημά μας ήσυχο και ασφαλές έστω και αν δεχτεί το πενταπλάσιο θερμικό φορτίο σε σχέση με το TDP της, όχι μόνο κατατάσσεται στην κορυφή της λίστας των αεροψυκτρών, αλλά υποσκελίζει και μερικές λύσεις LC-AIO, δείχνοντας με τον καλύτερο τρόπο, ότι ο θόρυβος δεν είναι αναπόφευκτος συνοδός των υψηλών επιδόσεων! Μοναδικά της "μειονεκτήματα", ο μεγάλος όγκος και η σχετικά υψηλή τιμή της. Αλλά, με τη φυσική του πράγματος να απαντά στο πρώτο, και την ποιότητα κατασκευής, τις επιδόσεις και τον χαμηλό έως ανύπαρκτο θόρυβο, να αντισταθμίζουν και με το παραπάνω το δεύτερο, δεν μας μένει ουσιαστικά τίποτε να της καταλογίσουμε ! Con i tre modelli speciali (SE-AM4) analizzati l’azienda intende soddisfare le esigenze di qualsiasi tipologia di utenza, spaziando da tutti coloro che necessitano di una soluzione compatta al punto da poter essere agevolmente impiegata all’interno di chassis di dimensioni contenute e con spazio interno ridotto (NH-U9x65 SE-AM4), sino ad arrivare al “mastodontico” NH-D15 SE-AM4, capace di garantire le migliori performance dissipanti possibili a fronte però di un ingombro certamente non indifferente. 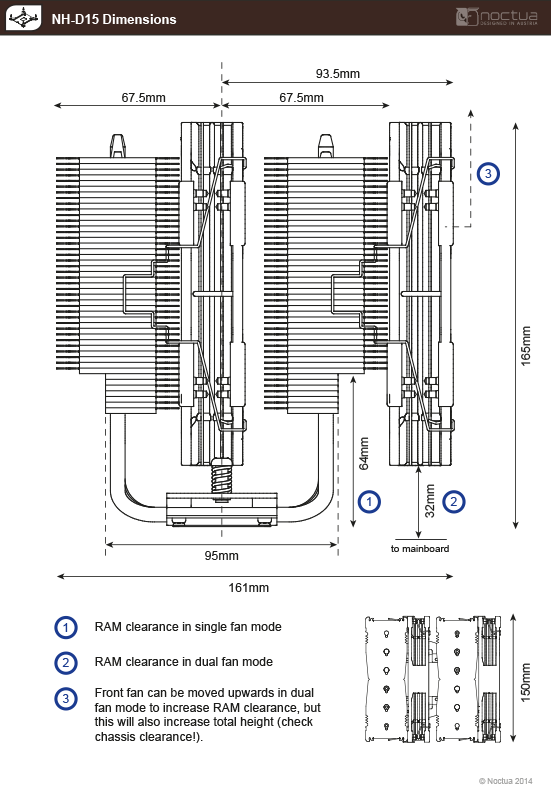 Le dimensioni infatti, pari a ben 160 x 150 x 135 mm senza ventole installate (165 x 150 x 161 mm con ventole), risultano decisamente importanti, al punto che è altamente consigliabile verificare di avere lo spazio necessario all’interno del proprio cabinet al fine di procedere senza noie all’installazione di questo “gigante” a doppia torre. Anche il peso complessivo non è certamente da meno, sfiorando il chilogrammo (per la precisione 980 grammi) senza ventole, e raggiungendo i 1.320 grammi in configurazione a doppia ventola (NF-A15 PWM). Degna di nota anche la soluzione intermedia, NH-U12S SE-AM4, capace di ottime prestazioni (con possibilità di installazione di una seconda ventola) seppur con un ingombro relativamente contenuto se rapportato alla proposta di punta della linea. Il suo design classico a singola torre centrale dal ridotto spessore, inoltre, consente di evitare qualsiasi fastidio in fase di montaggio, garantendo la massima compatibilità possibile con qualsiasi scheda grafica PCI-Express e con i più disparati moduli di memoria RAM, anche contraddistinti da design ad alto profilo. Si vous cherchez un ventirad qui aura le maximum de performances alors le NH-D15 est fait pour vous, si vous avez la place de le caser sur la carte mère et dans le boitier. Le NH-U12S quant à lui permet d'être installé dans beaucoup plus de configurations différentes avec une taille largement plus petite que son grand frère, les performances sont bien entendu moins bonnes mais largement suffisantes pour tenir un processeur au frais. Le NH-L9x65 pour finir est définitivement adapté pour les boitiers qui ne dispose que de très peu d'espace, il sera suffisant pour un processeur aux fréquences d'origine mais si vous comptez overclocker il faudra s'orienter vers un modèle plus imposant. El cooler NH-D15 SE-AM4 no defrauda ni lo más mínimo, ofrece unas prestaciones realmente extraordinarias que mantienen cualquier procesador de la nueva gama Ryzen muy alejado de temperaturas extremas perjudiciales para el procesador, ofreciendo unos excelentes 38ºC en FULL , todo ello bajo un silencio de funcionamiento ejemplar, como es norma de Noctua. Podemos ver que este disipador en reposo ofrece una media de 26ºC, llegando a un máximo de 30ºC, mientras que durante los test de benchmark este ha elevado la temperatura media a los 40ºC y ha llegado a un máximo de 49ºC. La diferencia con otros Ryzen es que no cuenta con XFR activo, por lo tanto la temperatura será más estable y no será tan elevada como en los procesadores que cuentan con la ‘X’. Debemos destacar que estos procesadores inicialmente tenían algunos problemas de temperatura, pero se debían a una lectura errónea del sensor del procesador, algo que se ha solucionado, por lo cual es temperatura real. I would assume that most everyone is familiar with the Noctua NH-D15 heatsink and the Noctua NH-D14 that was released over seven years ago. These coolers offer the best of both worlds given the excellent thermal performance of the dual tower design and even better acoustical performance due to fan efficiencies and oversized design. Besides top performance it offers also silent work and full compatibility with all available devices. Additionally it’s covered by six year warranty. You are receiving the best product for your needs. The only issue for some users can be size of the heatsink. For those users I recommend to take a look at other Noctua AM4 coolers which are also the best in their class. Noctua NH-D15 easily receives FunkyKit’s Editor’s Choice Award! Moving onto overclocked temperatures, we see more of the same at idle. The silent fan curve has the highest delta at idle of 10c resulting in 35c, which is still very acceptable in terms of thermals. At load, the delta spread is still very tight with a spread of 3c between the fan curves. The highest temperature attained is on the silent profile with a delta of 27c, getting a max temperature of 52c. You have a lot of head room to overclock with the amount of thermal dissipation you’re getting with the D15 and even more so if you optimize your fan curves and the airflow in your case. So far the D15 has certainly given a very convincing performance.